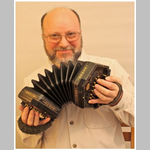 Jody is a brilliant singer songwriter and Anglo concertina player who is touring from the States. He sings Traditional and popular America songs of yesteryear. From witty and humorous ditties to songs that explore the depths of the human condition, his singing tells American stories that are hilarious, gritty and true stories of train wrecks and wrecked marriages, death row convicts and lonesome lovers, heroes, losers, swaggering braggarts, lazy slackers and slapstick fools. A treat for the chorus singers among you.